Whether you are using wood, stone or SIGN·FOAM, carving is an art form unto itself. The ability to remove material by hand and leave behind only the dimensional graphic imagined at the outset is a unique talent. Whether you are an accomplished or new sign carver, SIGN·FOAM presents an opportunity to work in material that has many of the best characteristics of wood without wood&apos;s greatest limitation, grain. The absence of grain allows you to cut, sculpt, and shape in any direction without fear of splits, hard spots, soft spots or knots. Because SIGN·FOAM is unicellular [no grain whatsoever], regardless of which direction you cut it, it reacts in exactly the same way. SIGN·FOAM sheets are consistent all the way through, so problems associated with woodcarving are eliminated. SIGN·FOAM is the perfect material; it&apos;s versatile and will shorten any learning curve or project to quickly unlock your carving potential. Tips for Additional Carving Resources: If you are interested in learning the art and craft of carving, or are new to the carved sign business, you may want to investigate books and classes related to the subject. Your education does not need to be sign related as carving truly is an artistic expression. 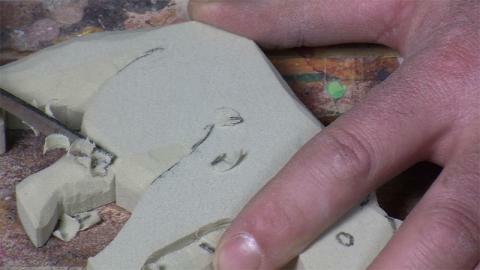 Once you learn the fundamentals of three-dimensional carving, the sign application becomes clear. Fancy carving tools are not a prerequisite for creating fantastic signage. Because of its relative ease to carve, you do not need top-of-the-line tools to do top-of-the-line work. SIGN·FOAM lets you create successful projects right from the start, without a huge investment in expensive tools. "V" parting tool: One of the most useful carving tools for sign-making this tool is available in various angles that affect the depth and width of the cut. The "V" tool can be used to carve letters, define and separate design elements, clean and sharpen corners, or draw (woodcut) designs into SIGN·FOAM . Venire or a U gouge: Useful for the same functions as a V parting tool, but leaves a soft line with an even thickness and rounded bottom. Half round U gouges are essential for roughing out material and for creating tool mark texture in backgrounds. Riffler files and rasps: Riffler files are specialized files that come in a variety of shapes and sizes. Found at a good woodworker&apos;s store or in a woodworker catalog, a full set can cost as little as $0.00 and these pay back immediately. They add contour to the elements that make up your sign including letters, borders, and applique of all types. With little additional effort, you can turn a plain cutout letter into a stylized prismatic letter. These are very useful tools for finish work in detailed carvings. Course grit sandpaper: Buy various grits of sandpaper to machine large sweeping contours or to quickly soften sharp edges. You will need and use them all. Keep an assortment of grit on hand from 50 to 320. This covers everything from shaping to finish sanding. Whether hand held or by machine, sandpaper is absolutely essential in achieving your final surface in SIGN·FOAM . Tips for Sanding Flat Surfaces: Be sure to use a very hard sanding block as the contour may change with hand sanding.